© 2010-2011, Kevan Hashemi Open Source Instruments Inc. Note: All scripts we present in the following entries are designed to run in Neuroarchiver 47 or later. For possible conflicts with earlier versions, see here. Here we present our efforts to achieve the best possible reception from our SCT (Subcutaneous Transmitter) implants. Our collaborators are Matthew Walker and his group (Pishan Chang, Rob Wykes, Stephanie Schorge and Joost Heeroma) at the Institute of Neurology (ION) University College London, and Alex Rotenberg and Sameer Dhamne at Children's Hospital Boston (CHB), and Louise Upton at Oxford University (OU). [26-JUL-10] We receive M1278417564 from Rob at ION. Transmitters No4 and No8 record EEG for an hour. Rob is pleased with the recordings, but reception robustness is only 75% for both transmitters, while our target is 95%. We do not understand the poor reception. Earlier this year, Matthew fixed poor reception in one experiment by re-seating the enclosure lid. Rob suspects that the faraday enclosure lid was not replaced properly by the animal caretakers, but we cannot confirm this hypothesis. [06-AUG-10] At CHB, we record 1000 seconds of data in archive M1281121460 from a rat roaming freely in the faraday enclosure with transmitter No10. We use a newly-refurbished Data Receiver (A3018C). The transmitter electrodes cemented to the skull using silver epoxy. 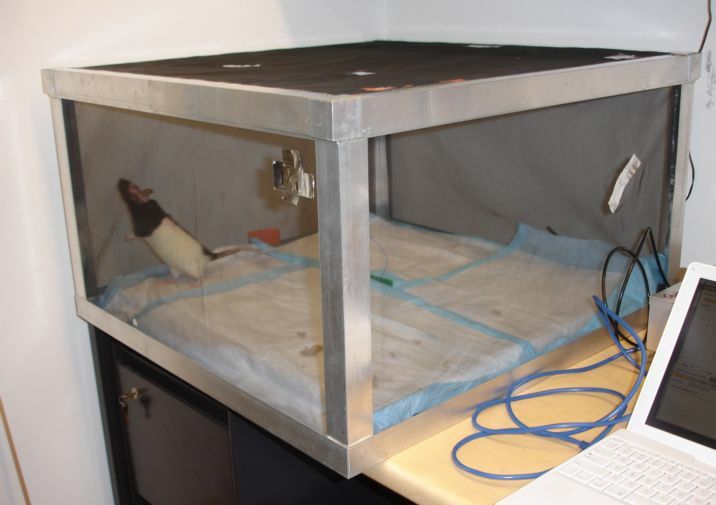 The rat spends most of its time along the edges of the enclosure and in the corners, often pressing the transmitter close to the conducting walls. Reception in 4-s intervals is 93% on average, 5% minimum and 99% maximum. Figure: Rat Roaming Freely in Faraday Enclosure. Archive M1281122799. We put the rat in a cage within the enclosure. It roams around the cage, going from within a few centimeters of the antenna to within a couple of centimeters of the wall. We record 140 seconds in archive M1281122799. Reception is 98.3%, with minimum 97% and maximum 99.3%. [10-AUG-10] At CHB, Yingpeng implants transmitter No8 and Sameer records three one-hour archives. Speaking of the first archive, he says, "I observed that the signal reception had dropped significantly when I was checking mail on my iphone while sitting close to the cage (File # M1281455686, t~800sec). So I deliberately turned on the 3G network on my phone and the EEG reception was lost again (File # M1281455686, t~1100)." At times 800 s and 1100 s, reception from both transmitters stops almost completely and simultaneously. Also, Sameer injects both animals with kainic acid during the recording, which requires the lid of the faraday enclosure to be removed. Injection times are No8 300-365 s and No10 370-430 s. For the entire M1281455686 recording, reception robustness was 90% for No8 and 95% for No10. Our target is 95%. We looked up the frequency and power output of the iPhone. In the US, it uses 869-894 MHz. The maximum permissable output power for a cell phone in this band is 33 dBm, or 2 W, and it appears that most phones are able to transmit the full 2 W, although they most often operated at much lower power output. Even with the best band-pass filters, there will still be 10% of the power spilling over into the low end of our 902-928 MHz ISM band. Our transmitters project around 50 μW out of the animal's body. The enclosure we lent to ION provides between 20 dB (99%) and 40 dB (99.99%) interference rejection, depending upon how well the lid is sitting on the frame. Furthermore, the signal from a transmitter must be at least 10 dB (ten times) more powerful than interference for proper reception. It is easy to see that an iPhone transmitting at the right frequency, just outside the enclosure, will stop reception from an implanted transmtter. Furthermore, this setup uses an unshielded cable to deliver power to the Data Receiver. It turns out that unshielded cables are associated bad messages, which suggests that they allow interference to enter the system and corrupt the radio reception. See here for more details. In M1281460570 we see three periods of simultaneous signal loss and one period several minutes of poor reception from transmitter No8. For the entire recording, robustness is 92% and 98% for No8 and No10 respectively. Figure: Reception from Two Implanted Transmitters at CHB. Archive M1281464170. In M1281464170 we see no periods of simultaneous signal loss, as you can see in the above graph. Robustness is 95% and 99% for No8 and No10 respectively. [11-AUG-10] We hear from Stephanie at ION on the subject of cell phone interference. "How interesting! Rob certainly has an iphone, and while there was no computer up there, standard procedure involved using said iphone to call matthew in his office to ask if transmitters were on or off." [12-AUG-10] Sameer sends us M1281643595 and M1281647588 in which the signal from implanted No6 is recorded over 7000 s. The following figure shows reception during all 4-s playback intervals. Figure: Reception from Implanted No6 Transmitter. Archive M1281643595. Average reception is 97%. Robustness is also 97%. There are three periods of poor reception. The first is at around 300 s, where reception drops to zero for a few intervals. Sameer says, "Also the iPhone interference (done on purpose to reconfirm the finding) can be seen in the period t~270 to 300sec in file M1281643595." The second period is from 3500 s to 4500 s, when reception occasionally drops below 80%. The worste period is around 6000 s, when reception is below 80% most of the time for around 100 s.
[18-AUG-10] Sameer recorded another six hours of data from No6, which has been re-implanted with screws in another animal. The data spans six hour-long archives. You will find a graph of reception versus time here. The first archive is M1281985381. Average reception is 98.3%. Robustness is 99.8%. [25-AUG-10] Receive another six hours of data from Sameer at CHB, starting with archive M1282668620 and ending with M1282686620. The rat was less active and more asleep during these six hours. We plot reception here. Average reception is 97.6% and robustness is 97.6%. There are eight periods of poor reception, two of which see reception drop to zero. The first may be explained by the enclosure lid being improperly seated. We have no information about the cause of the other periods. [23-SEP-10] We receive seven hours of recordings by Tsung and Yingpeng of CHB from two transmitters. Transmitter No1 is a new A3019A and No8 is an A3013A. Two hours are from 15-SEP and the remaining five from 16-SEP. We apply the TPSPBP processor to obtain characteristics and run the RA analysis in the Toolmaker to calculate reception and robustness. Transmitter No1 has average recption 94.5% and robustness 94.8%. Transmitter No8 has average reception 96.9% and robustness 98.3%. We see that the new, smaller transmitter perfroms slightly less well, but still satisfies our target of 95% robustness. Closer examination of the data shows that reception from No1 is weaker in the first hour, with robustness 89.7%, and stronger in the other six hours, with robustness 95.7%. [24-SEP-10] We apply the RF analysis to the same characteristics files to look for reception failure. The analysis generates a list of events. Each event is reception dropping below 20%. We obtain 31 such events in all, of which are on No1, the A3019A. The two longest periods of reception failure are "M1284662749.ndf 768 1 22" and "M1284662749.ndf 860 1 6". The first one was loss of reception for a full 88 seconds. At the same time, No8 reception was robust. [27-JAN-11] Joost at ION sets up a four-enclosure system with our new A3015B antennas and our new A3021B antenna combiner. One of his antenna cables is ten meters long. He places twelve transmitters in his cages. He says, "I tested all transmitters in the setup you suggested. I have attached two characteristics files. The first with all transmitters close to the antennae and the second with the transmitters in the corners of the enclosures. Transmitter 9 is implanted, the rest is not." Figure: Reception from Twelve Transmitters from Four-Enclosure System with Active Antenna Combiner. Transmitter No9 is implanted. For first hour, other eleven are close to antenna. For second hour, they are in enclosure corners. Archives M1296139069 and M1296142669. Average reception is greater than 90% for all twelve. According to our simulations, collisions alone will lower the average reception from twelve transmitters to 92%, with an occasional minimum of 52% and average robustness of 97%. Robustness for the twelve transmitters over two hours, as measured in four-second intervals, is as follows: No1 100.0%, No2 99.9, No3 99.9%, No4 98.9%, No6 99.7%, No7 99.9%, No8 99.3%, No9 95.2%, No10 99.9%, No11 95.4%, No12 96.5%, No13 96.8%. In short: reception is superb. Our target is 95% robustness with 8 transmitters. [22-FEB-11] Rob at ION sends us recordings in M1298209850 from three implanted transmitters in a four-cage system. Reception is 98% or higher for all three transmitters. We see occasional reception drops in reception, and these tend to affect to transmitters at a time. Figure: Reception from Three Implanted Transmitters. The coincidence of reception drops suggests external interference is causing the drops, but we see no bad messages in the data during the drops. [14-MAR-11] While at CHB, we noticed reception failure from an implanted transmitter. We lifted the lid of the faraday enclosure. Reception returned to near 100%. We replaced the lid, reception dropped to near zero. We touched the mesh walls. Reception recovered. We opened the cage and moved the antenna 10 mm. Reception was robust again. The animal was near a metallic wall of the cage, with the antenna on the far side of the wall. We rotated the cage so that the antenna would never have metal in the line of sight transmission. We did not observe drop-out again that day. [03-APR-11] We receive from Joost 15 hours of recordings from control animals at ION. The recordings were made on 13-FEB-11 with four faraday enclosures, eight animal cages, an A3021B active antenna combiner, and an A3018C data receiver. The following graph shows minute-by-minute reception during the entire 15 hours. Figure: Reception from Eight Implanted Transmitters. Average reception ranges from 94.4% to 95.7%. We expect a loss of 5% from collisions, so we are well-satisfied with the system's performance. There is one period of a minut on No11 when reception drops almost to zero. Other than that, a more detailed search through the data shows hourly drops below 20% reception lasting around ten seconds. [28-JUN-11] We repaired and returned Louise's A3018C Data Receiver, and she tried it out again in her laboratory with three transmitters and no faraday enclosure. Here is reception for an hour. We see periodic collisions between pairs of transmitters. At time ≈200 s we see reception from all three transmitters dropping from external interference. Maximum reception is 100% and minimum is 77%. Figure: Reception in Louise's Laboratory, Three Transmitters, No Faraday Enclosure. The X signal from all three transmitters shows 50 Hz mains hum of amplitude 4 mV and similar amplitude harmonics at 100 Hz and 150 Hz. Louise and Lukasz took the Data Receiver down to their animal building and recorded from the same three transmitters on plastic cups in a faraday enclosure. Here is reception for one hour. We see the periodic collisions between pairs of transmitters that we expect. Minimum reception of around 86% occurs when all three transmitters collide at the same time. Maximum reception, however, is only 98%. Figure: Reception in Louise's Animal Building, Three Transmitters in Faraday Enclosure. The X signal from all three transmitters contain a peak at 90.5 Hz of around 20 μV, but no peak at 50 Hz. We examined the signal at time 500 s, when collisions are at a minimum. Roughly 2% of the messages are missing. The missing messages are distributed at random. There are no bad messages.